This is the second of two blog posts to accompany a display in Rylands Gallery. The first post focused on 19th- and early 20th-century material, this post explores 17th- and 18th-century attitudes to menstruation. From ‘termes’ and ‘courses’ to ‘the flux’ and ‘flowers’, the variety of terminology used to refer to menstruation in the 17th and 18th centuries reflects the complexity of beliefs relating to it. With no single fixed definition, attitudes depended on context and were both positive and negative. Medicine at this time was heavily influenced by ancient ‘humoral theory’, which held that health depended on the balance of four humours: blood, black bile, yellow bile and phlegm. Menstruation was therefore seen by many as the body’s natural way of discarding excess blood, or ‘plethora’. Too much or too little menstrual blood, however, could disrupt the equilibrium and cause a vast array of ‘women’s diseases’. Sussex physician John Pechey’s medical compendium, A General Treatise on the Diseases of Maids (1696) refers extensively to illness caused by ‘excess’ or ‘obstruction’ of menstrual blood. A “suppression of the courses”, Pechey warns, “is very dangerous and many desperate diseases arise from it”. He recommends tailoring the cure according to a “variety of causes”. If the patient simply has “too great a quantity of blood” to evacuate effectively, then the common practice of blood-letting is in order: “bleeding must be ordered in the Arm, and a large quantity of Blood must be taken away”. Such practices aimed to restore balance to the body. Pechey also argued that a woman’s “sedentary and idle life” could cause an excess of blood. Women experiencing excessive menstruation are prescribed a “sparing Diet and moderate exercise”. Conversely, in the 18th-century midwifery lecture notes also on display (pictured below), exercise is considered to bring on menstruation: “immoderate fluxes”, Robert Dobson writes, are sometimes caused by “too violent Exercise”. Menstrual imbalance was also linked to mental illness. According to German physician Michael Ettmüller, menstrual ‘deficiency’ presents an assortment of symptoms and has many causes, including the “disorder of the Stomac”, undigested food, and “Affections of the Mind”, such as “Frights, Sadness, Grief, and the like”. Another manuscript on display, Manchester physician Charles White’s lecture notes (pictured below), makes reference to the case of a Margaret Bruce, who is reported as displaying “hysteric symptoms” alongside an “obstruction of the menses”. It was common practice to note the menstrual regularity of female patients when considering certain disorders. In this way menstruation was used as a general barometer of health. All these items and many more will be on display in the Rylands Gallery until the end of March 2019. Come and explore for yourself! This is the first of two blog posts to accompany a display in Rylands Gallery. 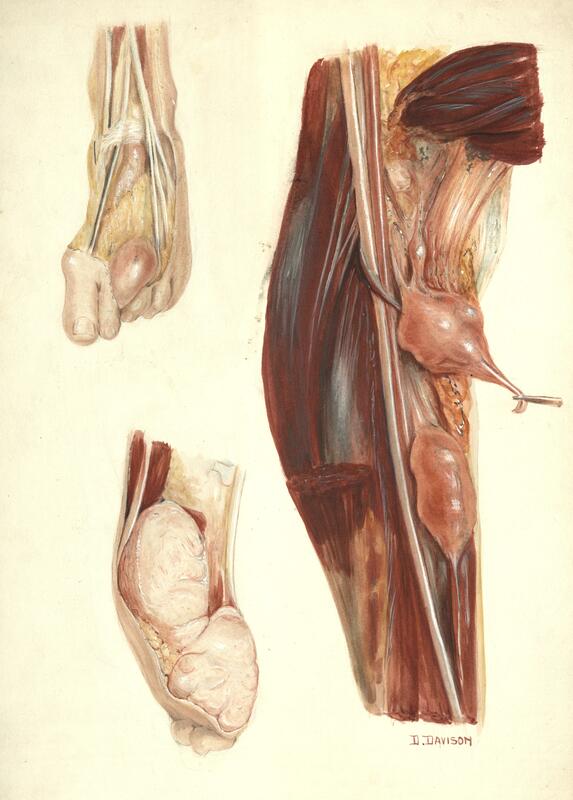 This first post explores 19th and early 20th century from the Library’s medical collections, currently being catalogued as part of a Wellcome project. Founder of the Manchester Babies’ Hospital and first female medical graduate of the University of Manchester, Catherine Chisholm (1878-1952) rightly takes her place in the current Library exhibition Women Who Shaped Manchester. She is also the inspiration for a new display in the Rylands Gallery exploring the history of attitudes to menstruation through a diverse mix of material from our medical collections. Until the early 20th century, there was no precise explanation of menstruation and medical definitions were largely informed by male specialists who had clinical contact with a small proportion of ‘unwell’ women. Throughout the 19th century, therefore, menstruation was commonly cast in pathological terms. Conducting a survey of 500 school girls, Chisholm’s pioneering thesis claimed that “no one but the sufferers can estimate the amount of pain.” Her findings challenged the notion that “incapacity” during menstruation was the norm and concluded that severe pain was uncommon. Significantly, she also implicitly made the case for girls in higher education, finding that menstrual discomfort was not aggravated by “hard mental work”. There have been instances … of females who the special mechanism we are speaking of remained germinal … They graduated from school or college excellent scholars, but with undeveloped ovaries. Writing anonymously in 1874, American physician Nicholas Francis Cooke added religious concern to Clarke’s supposedly scientific arguments. The impressively titled Satan in Society expressed moral outrage at “evils and dangers” of society’s “immorality and crime” in a comprehensive rebuttal of sexual ‘deviance’ in the form of masturbation, prostitution, abortion and women’s suffrage. In 1905 Emma Walker penned one of the first English guides for girls that addressed menstruation, offering stern advice to “keep a tighter grasp on your self-control” during the “periodic illness”. Health advice literature proliferated at the end of the 19th century, and the health of girls was a regular feature of health periodicals and general domestic guides. Increasingly, these guides were addressed directly to the girls in question, encouraging responsibility for their own health rather than the ‘traditional’ advice of their mothers. Such guides framed the symptoms of menstruation as nothing alarming and urged a rational approach to hygiene and emotional stability. Though the new ‘menstrual rationale’ offered information and freedom not afforded to their mothers, much advice for girls in the late 19th and early 20th century still urged discretion. “Too much care cannot be taken to keep yourself sweet and dainty”, Walker herself warned. Ideas of menstrual ‘disability’ may have been successfully challenged by medical women like Catherine Chisholm, but notions of taboo and secrecy surrounding menstruation still persist to this day. The case files of neurosurgeon Geoffrey Jefferson survive for patients admitted between 1927 and 1940 and inevitably a number of his patients were soldiers during World War One, and in one case the Boer War. Despite dating from over a decade after Armistice Day the effects of the war tend to play a part in these individual’s medical histories, some much more than others. Very often reference to a patient’s military past is brief and simply part of a thorough medical history, however there are a handful of patients who were still suffering the direct after-effects of their injuries many years later. Jefferson himself was a member of the RAMC during World War One and spent time working as chief surgeon to the Anglo-Russian Hospital in Petrograd before heading to the 14th General Hospital of the British Expeditionary Force in Boulogne, France as surgical specialist. He published a number of articles relating to his time in the RAMC largely relating to gunshot wounds to the head. Both patients 1928/7 and 1935/168 had received direct injuries to the head during the war which were believed to be the cause of their subsequent attacks of epileptiform fits. The former had received a gunshot wound to the temple whilst the latter had been injured by a hand grenade, small fragments of which could still be identified in the patient’s head on x-ray examination in 1953. There a number of patients amongst Jefferson’s case files that developed seizure disorders as a result of traumatic head injuries and very often little could be done surgically to treat them. Patient 1935/168 was one such case and was discharged home in status quo and treated medically and his seizures ceased naturally about three years later. 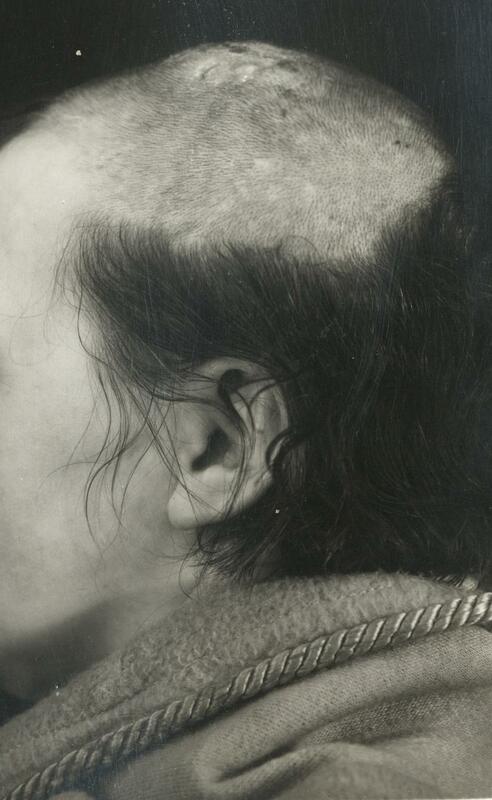 Patient 1928/7, however, developed an abscess in the right temporal region and following surgical efforts to drain the abscess died in December 1928. In September 1933 patient 1933/115 came under the care of Jefferson owing to a metastatic cerebral abscess. Central to this man’s condition was the bronchiectasis (disease of the lungs) he had suffered from since being gassed in the army. His condition quickly deteriorated and a post mortem examination confirmed the diagnosis and also identified multiple abscesses in the right lung. 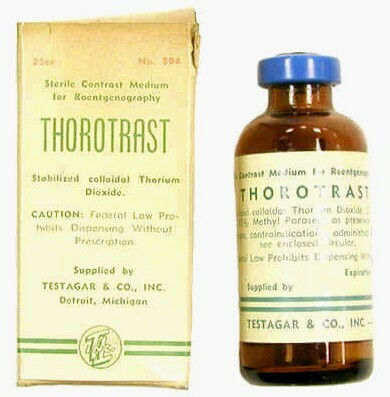 Strangely the medical effects of toxic gases, and particularly mustard gas, went full circle following World War Two. Manchester haematologist John Frederick Wilkinson worked closely with workers in the toxic gas factories during World War Two and his observations contributed to his work on the development of chemotherapy utilising nitrogen mustards to treat leukaemia. More information on his work can be found amongst his research papers also housed at the University of Manchester Library. Patient 1934/110 had been demobilised from the army in 1918 suffering from deafness and shell shock and was still receiving a pension as a result of this when he came to see Jefferson in 1934. A few months before his admission his condition deteriorated significantly with alteration in behaviour and severe lapses of memory. His wife reported that he would sit in a chair doing nothing and when asked what was wrong replied “my head is going wrong”. He only remained an inpatient under Jefferson for a couple of days and no treatment was recorded during this period and he was discharged as suffering from cerebral degeneration complicated by syphilitic periarteritis. 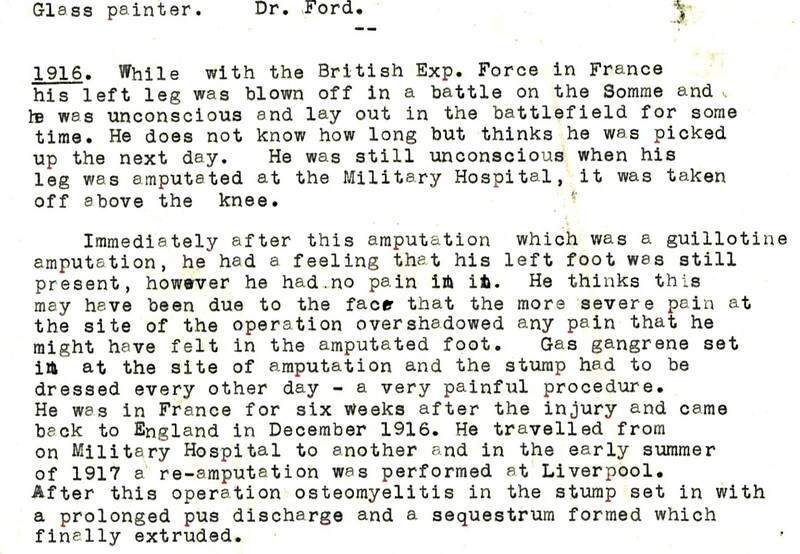 Whilst with the British Expeditionary Force in France in 1916 patient 1937/151’s left leg was blown off during a battle on the Somme and was amputated shortly afterwards. The patient reported that he was still able to feel his left foot immediately after the operation but was not troubled by pain. By the time he saw Jefferson in 1937 he had been experiencing regular episodes of extreme pain in his phantom limb, which had led him to contemplate suicide. 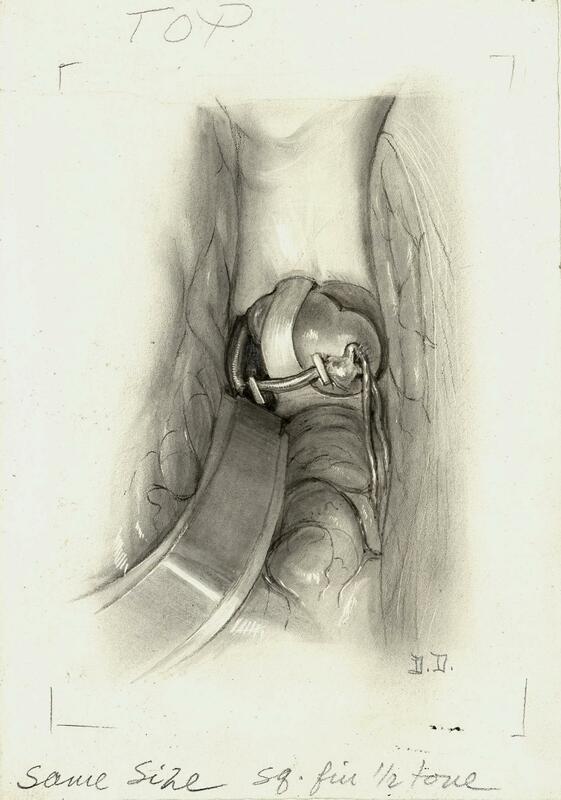 A surgical root section of nerves affecting the pain pathways to the limb, or cordotomy, was performed after which his pain subsided, although he was still aware of the presence of the limb. At first considered a success, a return of the patient’s pain was regrettably reported only a few months after his discharge. See an earlier posting by Dr Rebecca Wynter for further information about Jefferson’s involvement with phantom limbs during WWI. In conjunction with Jefferson’s personal papers relating to his work during WWI (including his time in Russia and research into amputations) and the works and publications of many of his contemporaries it is possible to gain an insight into the methods employed to treat war injuries, the medical research they informed, and how this influenced developments in the practice of medicine. Efforts to catalogue the University’s many and varied medical archive collections are continuing in earnest. 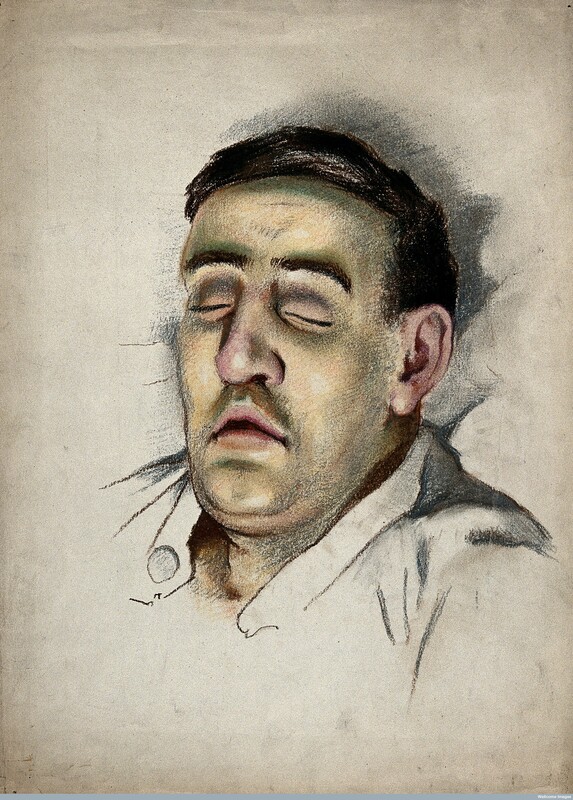 August saw the successful end of a project to catalogue the Manchester Medical Manuscripts Collection and the papers of 20th century haematologist John Frederick Wilkinson and at the beginning of September a new Wellcome Trust funded project began which will allow us to tackle several new collections. 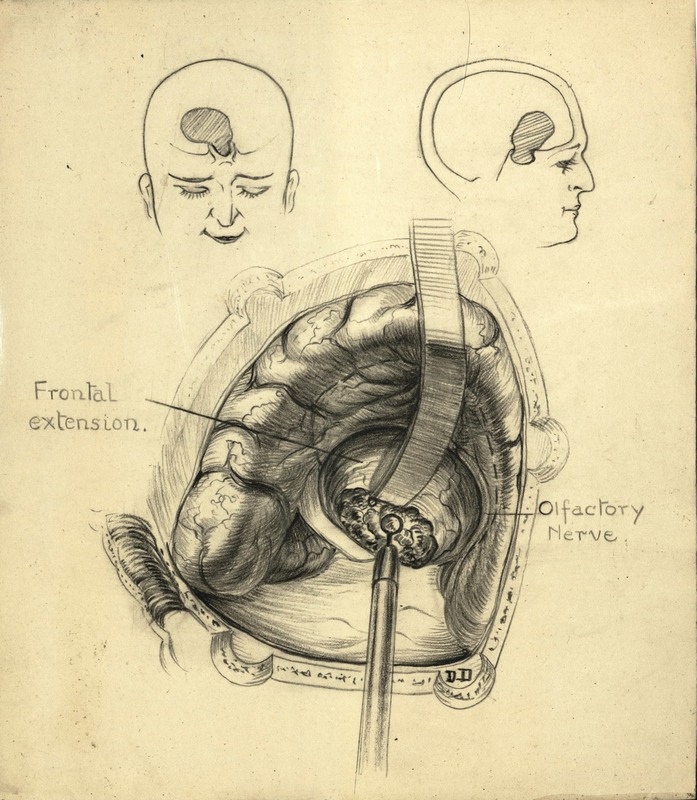 These include the early to mid-20th century case files of prominent Manchester neurosurgeon Geoffrey Jefferson, the medical illustrations of Manchester-based artist Dorothy Davison, and papers collected by William Waugh relating to artificial hip pioneer Sir John Charnley. 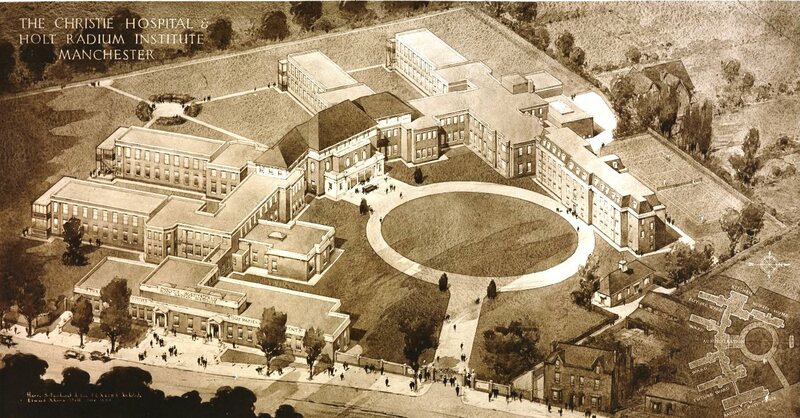 The Jefferson files represent a near continuous run of patients he saw at the Manchester Royal Infirmary from 1927 to 1940 which informed his research and served to illustrate many of his published papers. The files contain the full range of records you would expect to see in patient case files, such as case notes, clinical reports, charts, correspondence, and in some cases clinical photographs and x-rays. In the interests of his research Jefferson also followed a number of the cases up many years later to ascertain the state of the patient’s health following treatment and discharge. As part of the cataloguing process information recorded about each patient will include age, diagnosis, symptoms, surgical procedures, and the result of treatment to best facilitate detailed research. Similar collections of neurosurgery files exist in archives across the country including the Norman Dott Papers at the Lothian Health Services Archive (LHSA), case notes of the National Hospital for Neurology and Neurosurgery at UCL, and the records of the Military Hospital for Head Injuries at St Hugh’s College, Oxford. The addition of the Jefferson papers to this mix will see the creation of a network of collections and a formidable resource for the study of the development and practice of neurology and neurosurgery across the UK in the first half of the 20th century. Huge suprasellar extension in the right frontal lobe. 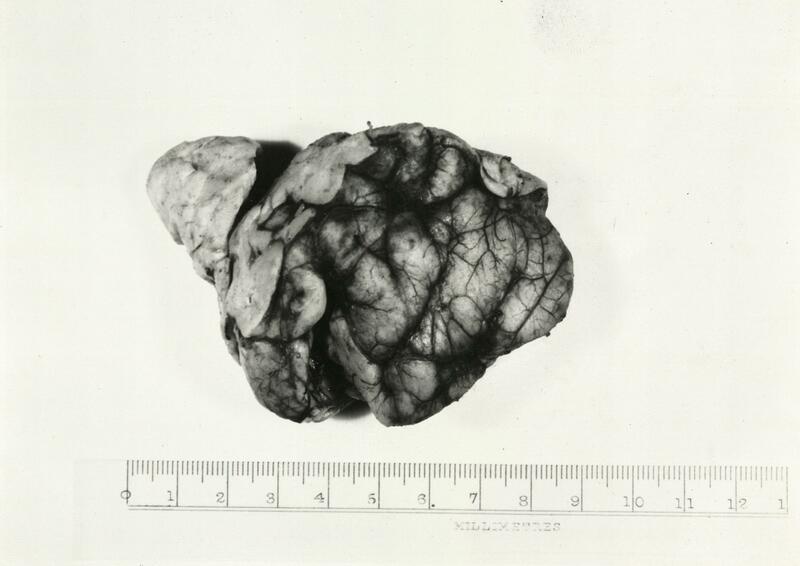 Sketch of tumour as seen at operation. 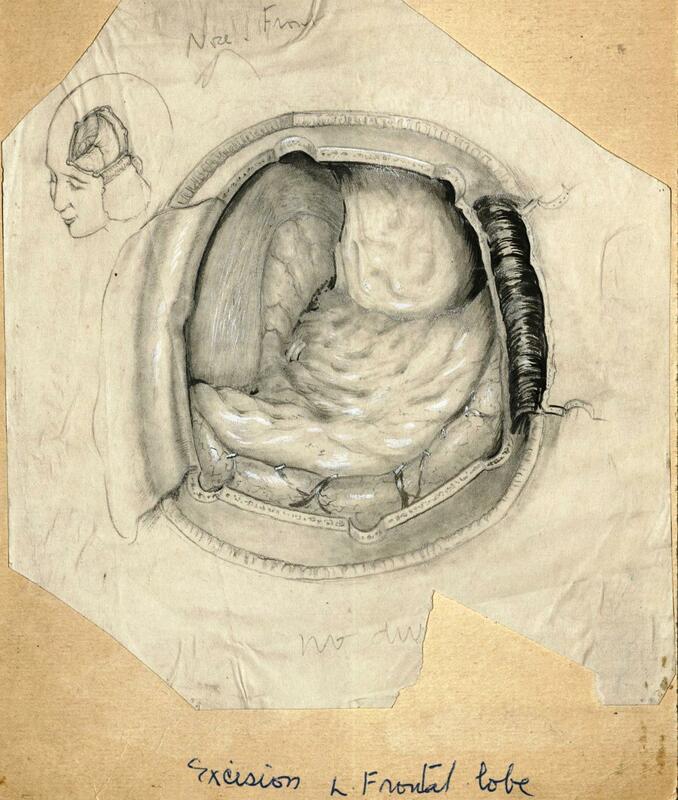 The other major element of the upcoming project involves the medical artwork of Dorothy Davison. 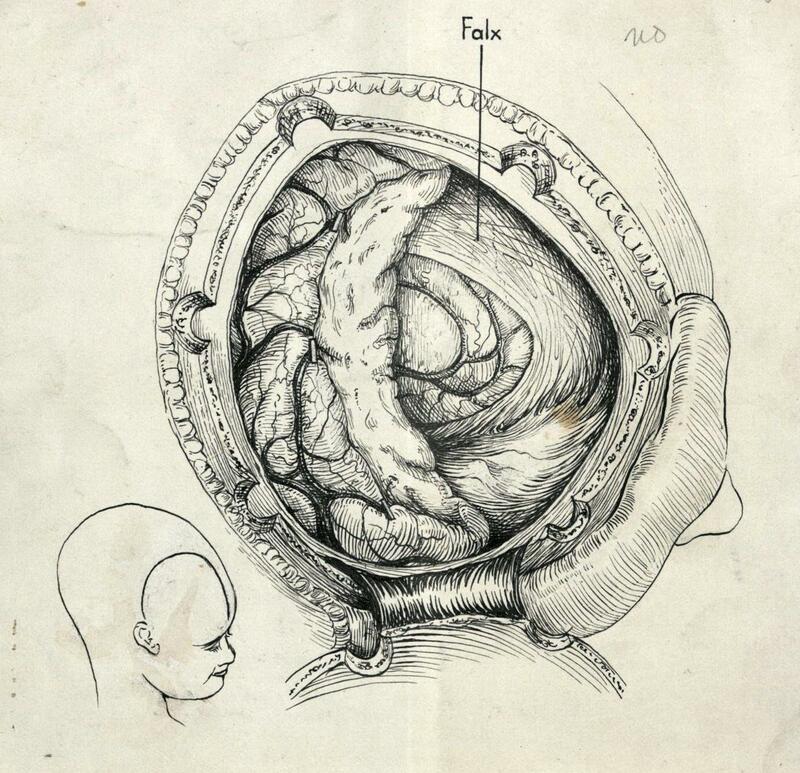 Davison spent all her working life in Manchester where she created intricate illustrations to accompany the research work and publications of a number of Manchester’s medical academics. She produced a great many pieces to accompany the work of Geoffrey Jefferson and it is hoped that it will be possible to make links between her artwork and the case files belonging to the patients they represent. We will be posting more updates as the project progresses so look out for more posts.